Hi Everyone, I am so excited to show one of the reasons I have not been posting very often this summer. My reason is that I have been gardening. Well, yes, gardening. I am not a gardener. I hate getting down in the dirt. I don't like getting dirt under my fingernails and I hate being outside with the mosquitos. The garden I am playing around with this year is different. 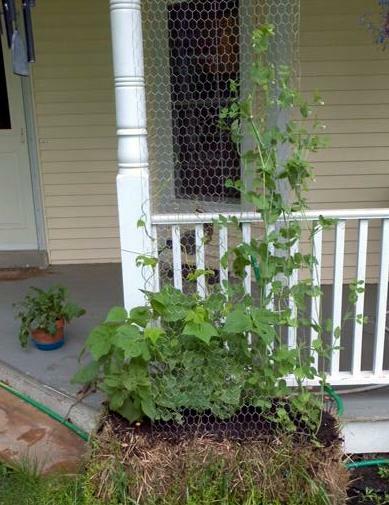 It's called Straw Bale Gardening and you can read about it HERE. I was sold on the idea when I first heard about it from one of my stamping friends. I bought the bales and Bob started hooking up the system for me. 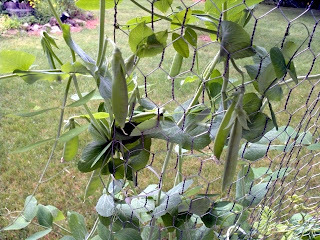 What you see in this picture are my first Sugar Snap Peas and they sure are good. This bale is in front of my front porch with chicken wire for the peas and beans to climb on. I first made the mistake of planting bean seeds that were too old and they didn't come up. Always trying to save a buck. So I dug them up and started over. This is why the peas are ahead and already have "food" on the vine. The beans are just beginning to climb and will soon have flowers. Yes, you plant IN the bale. The bale turns to compost by the end of the summer and you start over in the spring. (or if it's early enough, you can plant another batch in the same bale this year.) So I am very excited to get my first peas. I have another bale on the other side of my Front Porch with cucumbers growing nicely and 4 more bales out in the yard with cabbage, broccoli, a tomato plant, a huge pumpkin, (well that's what the package says anyway) a zucchini plant and 3 potato plants. The BOOK says three potato plants COULD get an entire bushel of potatoes. I'll let you know. I'm sure hoping!